The conflict in Syria has claimed a staggering numbers of lives; human rights abuses are widespread, in particular Sexual and Gender Based Violence (SGBV) against women and men, girls and boys, as well as a range of violations against or affecting children, for which there is no accountability. Important documentation work is being done by Syrian organisations, but they have identified a need for improved knowledge, capacity and improved coordination. On 26-28 March 2016, NPWJ organised a roundtable on “Accountability, Sexual and Gender Based Violence, Women’s Rights and Children’s Rights in Syria”, at which many organisations working on documentation indicated a need to improve their knowledge on a range of issues including best practices for collecting and storing information in such a way that it has the potential to be used as evidence in future prosecutions and other accountability processes. To answer these needs, NPWJ organised a workshop on “Documentation Protocols and Best Practices”, which took place in Gaziantep on 24-26 August 2016. 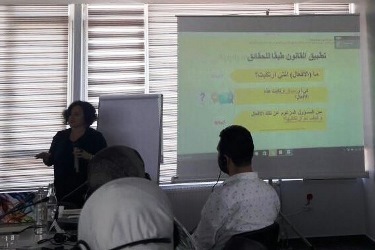 Participants consisted of representatives of Syrian CSOs and NGOs who work on documentation, SGBV and other crimes against men, women and boy and girls, with a focus on smaller organisations who could particularly benefit from this workshop. By developing the documentation skills of these organisations, the workshop was also designed to strengthen assistance to victims of violations on the ground while also helping to challenge abuses and address the denial of justice to survivors. The workshop, which was led by internationally recognised experts on criminal investigations and prosecutions at the highest level, focused on fundamental principles for documentation, including specific factors to consider when interviewing child victims and victims of SGBV; realistic and effective protocols for handling evidence including chain of custody of physical and documentary evidence; relationships with witnesses and intermediaries that include risk management protocols; and other similar issues. This workshop was supported by the European Commission and the Open Society Foundations. NPWJ has supported the Syrian civil society since the inception of the Syrian crisis and, since October 2013, has established an office in Gaziantep, Turkey, from where it conducts its Syria-related activities by empowering and increasing the capacity of Syrian CSOs and democratic activists to act and advocate for transitional justice and accountability for war crimes and crimes against humanity.